If you find yourself sneezing a lot in September or experience watery eyes, runny nose and serious postnasal drip, than you might just be allergic to ragweed pollen. 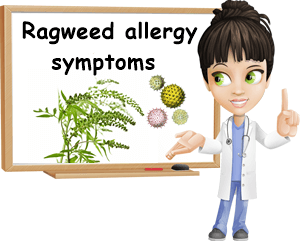 Ragweed (Ambrosia) is a weed in the daisy family that produces a highly allergenic pollen which is a cause for allergic reactions. Ragweed is one of the most common fall allergies throughout North America and Europe and one of the lengthiest, as ragweed pollen season can extend from late August to late October, or until the first frost occurs. What is ragweed? Ragweed is a weed found throughout North America, Europe, Asia, Africa, Australia, New Zealand and essentially any temperate area in the world. It is a member of the daisy family which includes others common species such as dandelion, daisy, Echinacea, calendula (marigolds) and yarrow. Ragweed is an invasive species and, similar to many daisy species, a highly allergenic plant. It alone is responsible for almost half of the late summer-fall allergies. The common ragweed (Ambrosia artemisiifolia) and the great ragweed (Ambrosia trifida) are two highly widespread ragweed species. Ragweed allergy season. Ragweed allergy season peaks roughly from late summer to mid fall. However, ongoing climate changes have caused changes in ragweed allergy season as a result of seasons shifting, warmer temperatures, dry weather, all of which affect ragweed distribution and life cycle. For example, as a result of higher temperatures and desertification, ragweed species have not only spread, but also lengthened their life cycle and pollen production period which is causing ragweed pollen season to extend till late fall. Less rainfall also favors the spread of pollen particles, resulting in more severe allergies. How long does ragweed allergy season last? Ragweed allergy season 2015, 2016, 2017 lasted roughly from late August till November, peaking in September. What does ragweed look like? Ragweed is, as its name suggests, a weed. It can be as short as a few centimeters or as tall as four meters. It has composite green leaves with three to five leaflets, smooth in some species, toothed in others. The leaves look similar in appearance to fern leaves, but less divided. Personally, they remind me of tomato leaves, just pointier. Ragweed flowering season peaks in September and most plants of the species produce tiny yellow-green, cup-like flowers arranged in long, upright spikes and containing a highly prolific yellow pollen. The pollen is carried by the wind over long distances which is how both ragweed plants and allergy spread. What causes ragweed allergy is the very pollen of the plant species. Ragweed plants are highly prolific pollen producers. The spike-shaped plants are made up of numerous tiny, yellow-green flowers which release huge amounts of yellow pollen particles. Because they are light, these pollen particles travel easily in the air over extremely long distances, hence the reason why ragweed allergy is so widespread. In addition to this, ragweed pollen is even more allergenic than other types of pollen, adding to the severity of the allergy symptoms. 1) Sneezing and runny nose with clear or white mucus from inflammation. (See other nose mucus colors and what they mean). 2) Nasal congestion, especially after sneezing several times. 3) Postnasal drip which causes irritation of the airways. 4) Sore throat and hoarseness. 5) Itchy mouth, itchy throat. 6) Itchy ears when the pollen enters the ears. 7) Itchy skin from direct contact with the pollen. 8) Watery eyes, redness and swelling, itchiness. 10) Laryngospasms and asthma attacks. How does ragweed allergy affect you? Pollen activates the immune system because it is a foreign particle. Some immune systems being oversensitive or heightened, they react more aggressively to all foreign particles. So when ragweed pollen comes into contact with the skin or is breathed in, the immune system activates and releases antibodies to capture it and eliminate it from the body. This otherwise normal response causes inflammation in the body through the release of histamine from various white blood cells and can lead to airways becoming so inflamed their obstruct breathing. If ragweed allergy is severe, contact with the pollen through skin and breathing can potentially escalate into anaphylactic shock. This is why it is vital to avoid allergy triggers at all costs, carry your essential medication with you at all times and seek medical help immediately if your condition deteriorates in the slightest. Below is a video of ragweed plants to help you get a better idea of what they look like. 1) Essential medication (example: asthma inhaler). It is prescribed by a doctor following confirmation of ragweed pollen allergy. Skin prick tests, blood tests, antibody tests are commonly employed to diagnose allergies. 2) Antihistamines. Although not necessarily essential, antihistamines block histamine production, reducing inflammation which improves symptoms. Remove ragweed plants from your home garden to minimize exposure. Avoid going out on hot, dry, windy days when pollen counts are usually high. Change clothes after being outside. Do not bring shoes inside. Shower if possible to remove pollen from hair. Wash face after being outside. Keep windows closed during the day to prevent pollen from getting in the house. (Ragweed pollen count is minimal on rainy days, early in the morning and at night). 4) Carry water with you at all times. What I’ve learnt from my experience with allergies is that it is important to stay hydrated and always have water with you. If you breathe in pollen, you can avoid laryngospasms or an asthma attack by taking small sips of water to wash down pollen stuck to the throat. Sparkling water is better than still water, but any water can help. If this doesn’t work, use your medication and seek medical help. Fizzy drinks: rich in sugar, they make pollen stick to the throat lining easier and thicken mucus. Coffee, caffeinated beverages, alcohol cause dry mouth and throat and favor allergy. Milk and dairy: too much thickens mucus. Foods that cause acid reflux: foods that cause acid reflux increase the chances for laryngospasms and even asthma attacks during allergy season. 6) Vitamin C natural antihistamine. I take 1 g of effervescent vitamin C daily starting several weeks before ragweed allergy season till after it ends. Vitamin C is a strong antioxidant and natural anti-inflammatory, reducing histamine production and improving symptoms of allergic rhinitis. It also helps me eliminate phlegm and sleep better. Talk to your doctor about the benefits of taking vitamin C for ragweed allergy.